The third day of the Dashabdi Mahotsav, 24th December 2010 was a historic day for Kenya. Disciples marched through the streets of Nairobi in the form of a grand peace procession. H. H. Swamibapa Pipe Band led the procession after a guard of honour to His Divine Holiness Acharya Swamishree. 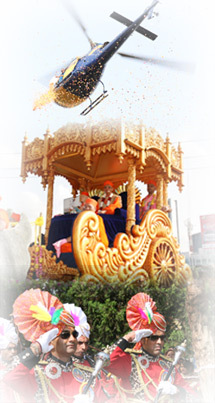 Lord Swaminarayanbapa Swamibapa with His Divine Holiness Acharya Swamishree was seated on a majestic chariot fabricated and decorated by the sant mandal and disciples. Several grand chariots, motorcycles, carts and a helicopter formed the peace procession. Disciples dressed in colourful attires danced during the procession, others carried ceremonial flower pots, while the rest sang victory slogans of Lord Swaminarayanbapa Swamibapa. A helicopter flown by one disciple continously showered rose petals from the helicopter upon Lord Swaminarayanbapa Swamibapa and the marching disciples. Thousands of Kenyans lined up the streets to watch this exceptional event taking place in the streets of Nairobi. The procession conveyed a message of peace to Kenyans and the entire universe through local and international journalists who flocked the streets to capture this incomparable event in Nairobi. After four hours of marching, the procession ended at Swaminarayan Temple Nairobi. A mouth-watering mahaprasad in the form of Jalebi, Ganthia, Rotli, shaak, Khichdi, Kaddhi and chhaas rejuvenated everyone after a long but pleasant procession of peace.